The Portable XRF Analyzer is the modern instrument of choice for the elemental analysis of a wide range of materials. Portable XRF is practical, easy, and cost-efficient. Bruker Elemental has been a global leader in XRF analysis technology since 1982. Please message us via the form on the right to find out which of our portable XRF models best suits your industry’s needs, how using a portable XRF gun will increase your productivity ROI, to schedule a free demo, or for a prompt quote. The technology behind Bruker portable XRF equipment utilizes the physical phenomenon of X-ray fluorescence, or XRF for short. It is the emission of distinctive “secondary” X-rays by a material sample when exposed to high-energy X-ray radiation. 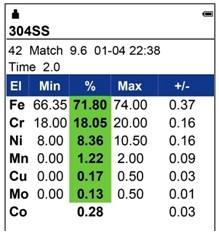 The atoms of individual chemical elements in materials that are analyzable by XRF will enter a state of excitation, emitting unique spectral responses that are scanned and parsed by an XRF gun to determine its type and chemical composition. Bruker’s present-day generation of Portable XRF analyzers comes very close in precision and performance to the traditionally more powerful, much larger analytical lab equipment, when it comes to analyzing any chemical elements from Mg to U. This means that you can “portably” analyze and sort your relevant materials at any location, not limited to a lab. A portable Bruker gun is a lean, mean machine, small and robust, advanced but easy, flexible and safe use. You are currently on Bruker’s information site dedicated to portable XRF applications in the metals and alloys industry (including the precious metals). However, Bruker is famous for its full line of portable X-Ray fluorescent analyzers filling a great diversity of analytical requirements, also including popular applications in geochemistry, mining, mineral and soil testing, environmental assessment, consumer product screening, norm compliance verification, forensics, artwork analysis and conservation, scientific elemental research, etc. Please let us know what type of material you need to analyze, with any relevant requirements. A Bruker elemental analysis specialist will supply you with accurate information and product advice. It is interesting to know that the whole process of XRF fluorescence generation takes place in a tiny part of a second. It is the measurement that takes a bit longer. In the case of Bruker portable XRF guns it is 2 – 5 seconds for standard alloys, and a few seconds longer for light element alloys. Test time is a function of the type of material analyzed and the thoroughness level of the analysis. High concentrations take seconds to scan while part-per-million tracing may take a few minutes. The Bruker® S1 Titan: as Portable as it Gets! Five different configurations of the Bruker S1 TITAN portable XRF analyzer are available to best fit your needs, namely, models 800, 600, 500, 300, and 200. The 800 and 600 use a large area CUBE™ SDD detector, yielding the crispest, extra fast performance. The S1 TITAN 500, accurate and best value, comes equipped with a standard SDD detector, excellent for a great many portable analysis situations. The S1 TITAN 200 and 300 models are fitted with the least costly SiPIN detector. The analyzer’s typical calibrations include those for alloy, Au, precious metals, bulk material (electronic scrap, catalytic converters and so on), mining, soil, HazMat, and custom-defined calibrations. Contact us today with questions or to discuss the portable material analysis needs of your enterprise! Bruker’s proprietary SharpBeam™ technology incorporates an optimized detector and optimized tube geometry. It is chiefly SharpBeam™ that enables our portable analyzers to be small. It also lowers the detection limits (LoD) while enhancing quantification precision, minimizing power consumption, and prolonging battery life. Due to SharpBeam™ optimized geometry, measurement’s exactitude is significantly enhanced. Here is a cool fact: the new generation of Bruker’s large area SDD detectors (used in models 800 and 600) boast lower LoDs, better count rates, and higher analytical resolution than the SiPIN instruments, an older generation). One of the important advantages is the ease of light elements testing (Al, Mg,Si):no more vacuum or helium purges when it comes to those! Among the new optional features are an Integrated camera (for 800 and 600) and a small spot collimator (the 5mm spot size is standard for S1 TITAN models, but the 800 is optionally configurable with an 8 or 3mm spot). Using a portable XRF gun at your enterprise is ultimately about minimizing effort and maximizing ROI. For some users, full control of the testing process is also important; others benefit from long-term savings on lab analysis fees. The Bruker portable XRF analyzer is a lovely and inspiring machine to work with, and it very obviously gets its job done efficiently, as the accurate and clear analysis readout fills the integrated touchscreen practically in the blinking (or two)of an eye. 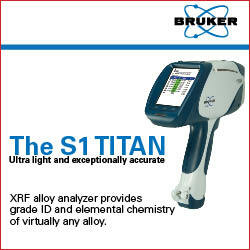 Please do not hesitate to contact Bruker for more information or a free demo of the portable XRF S1 Titan machine in action. Our material analysts and product experts are standing by to answer your query. If you have found the above information helpful, feel free to browse other relevant pages on this site, or write to us for a quick answer. For example, check out our general XRF analysis article or explore industry-specific XRF applications, including alloy analysis and precious metals testing with a portable XRF analyzer, as well as many other sections in our site library. We hope to hear from you with any comments or questions, it is easy!